Tue., Feb. 14, 2017, 11:49 p.m.
After they’ve hit the top of the polls for three consecutive weeks, it seems as though everyone is looking for an opportunity to watch the Gonzaga men’s basketball team up close and personal. But with only 6,000 seats inside the Kennel and all the tickets for the remaining home games already accounted for, fans will be limited to watching the Zags on the couch at home for the rest of the month. Some people are still determined to find tickets to watch the nation’s No. 1 team battle its final three opponents in Spokane. Several fans turned to scalpers on Craigslist to find tickets, with one buyer offering as much as $500 for a pair to any game. As of Saturday, tickets to Gonzaga’s last home games were either sold out or substantially marked up in value on several secondary markets. No tickets were left to purchase on TickPick and a handful were available on StubHub for as much as $500 apiece to the Saturday game against Pacific. Some scalpers on Craigslist were selling tickets to this week’s matchups against San Francisco and Pacific for about $100 apiece. Just as with most venues, reselling tickets in secondary markets for a higher price than the face value – which never exceeds $40 per ticket, regardless of the Zags’ opponent or the date of the game – is against Gonzaga’s policy. “We don’t want people to take advantage of people in the community in that way,” said Chris Johnson, an associate director of athletics at Gonzaga. Johnson said the university has discovered primarily season ticket holders who have attempted to sell their tickets at marked up prices over the years. Usually, the school makes an effort to remind the scalpers of Gonzaga’s policy. Johnson said some fans have lost their season tickets as a result of continuously making a profit from selling their seats. So how can you get a ticket to one of the biggest events in Spokane? Start planning for next year now. Most of the seats inside the McCarthey Athletic Center are already reserved for specific groups of people, such as season-ticket holders and students. According to Johnson, season-ticket holders take up roughly 70 percent of the 6,000-seat McCarthey Athletic Center. The remaining seats are split between students (1,200 seats), Gonzaga faculty members (300), student-athletes’ family and friends (four per player) and the visiting teams’ fans (150). 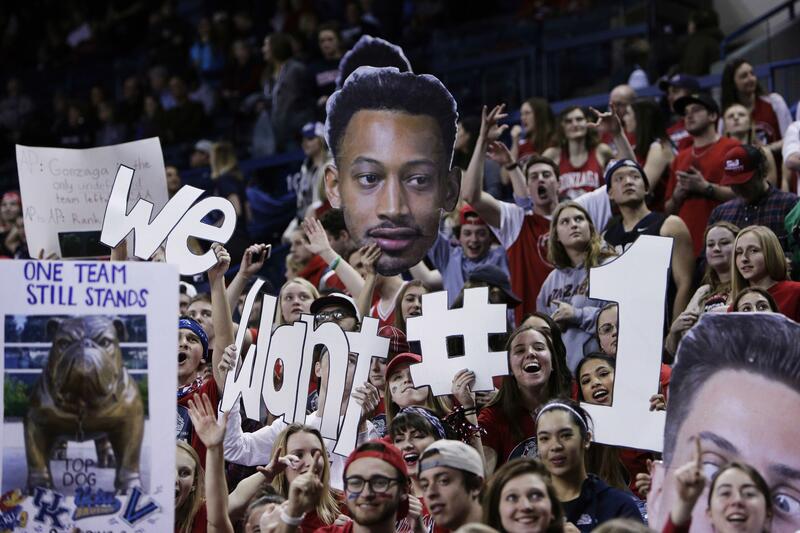 It you don’t fall into any of those categories, Chris Standiford, the deputy director of athletics, said Gonzaga has created a system in which fans can still find ways to get inside the Kennel. The answer? The Bulldog Club. The so-called elite group of Zags fans who actually aren’t that elite. They just know the system, and they know how to broaden their chances of getting a ticket to a game. Bulldog Club members have a lot more opportunities to see the Bulldogs play in the Kennel because any extra tickets that are not purchased by students, faculty members or the visiting team at the beginning of each week are sold to members for up to $40 on a first-come, first-serve basis. Johnson said every Bulldog Club member has the opportunity to attend at least one game a year, especially during winter break when 1,200 of the students’ seats are vacant. But there’s always a catch: To become a member, fans have to donate a minimum of $100, and if members want to eventually buy single-game tickets they must make a minimum annual donation to Gonzaga athletics of $250. The annual fee is designed to support the athletic department while minimizing the competition for tickets. Standiford said the university has tried to close the gap between the Bulldog Club members and those who can’t afford the annual fee by putting on events such as the annual Kraziness in the Kennel. If you are interested in season tickets, there is a waiting list based on a point system. The more money you donate, the faster you move up the list. The highest of five levels for Bulldog members is the platinum level, which is the first two rows of center-court seats at the McCarthey Athletic Center. That would cost $3,550 plus $750 for the season tickets and represents a small section of seats. There is also the gold level (a majority of the sideline seats) for $1,075 and $450 for the season tickets. The silver level requires a $600 donation, followed by the Zag ($325) and Bulldog levels. At high-level programs like Kentucky, Kansas and Duke, seats donations of $20,000 and more are common. He said most people don’t understand the mechanics of how the basketball program is funded. Published: Feb. 14, 2017, 11:49 p.m.